As the President Donald Trump’s political party lost the house in the midterm elections, he was seen expressing his anger on various occasions. This time too, his outrage might just fall on one of the Homeland Security Secretary Kirstjen Nielsen. The Washington Post reported that the US President has informed his advisers about his decision to oust Nielsen. According to five current and former White House officials, her departure from the administration is likely to occur in the upcoming weeks. This week, Trump cancelled a trip that was planned with Nielsen, where they had to visit the US troops at the border in the South Texas. The officials said that over the weekend Trump told aides that he wants her out as soon as possible. Three of them also said that the announcement could come as soon as this week. The president considers that Nielsen’s performance on immigration enforcement is lackluster, and has growled about it for months. He is believed to be looking for a replacement, who will implement his policies with more willingness. Since Trump has switched his decisions on key personnel decisions before, the Chief of Staff John F Kelly is making an attempt to postpone his decision on Kirstjen Nielsen. The aides said that she has been fighting the pending discharge of Nielsen. However, according to three White House officials, even Kelly’s future in the administration is uncertain. On Monday, officials of the Department of Homeland Security, who are working with Kirstjen Nielsen, declined to talk about her expected dismissal. Kirstjen Nielsen has been reluctant to leave the administration before completing one year as secretary on December 6. However, according to her colleagues, she has not been happy in the job for several months. Since she was hired, Trump had berated her several times in public and private. He has belittled her during Cabinet meetings and to other White House staff. Months ago, he casted suspicion on her loyalty and tagged her as a “Bushie,” making a reference to her service under former President George W Bush. With time, a rift developed between Trump and the Homeland Security Secretary. Several times, Kirstjen Nielsen had tried explaining him the challenges that some of his proposals carried, including completely shutting down the border with Mexico or drastically curtailing immigration. Aides said that Trump became impatient and frustrated since Nielsen has opposed some of his hard-line proposals and told him that they would not be feasible. Kirstjen Nielsen’s dismissal will be the second big departure from the Trump administration, since the Republicans lost the house in the midterms this year. She joined the string of high-profile administration exits after Attorney General Jeff Sessions, who resigned at Trump’s request last week. 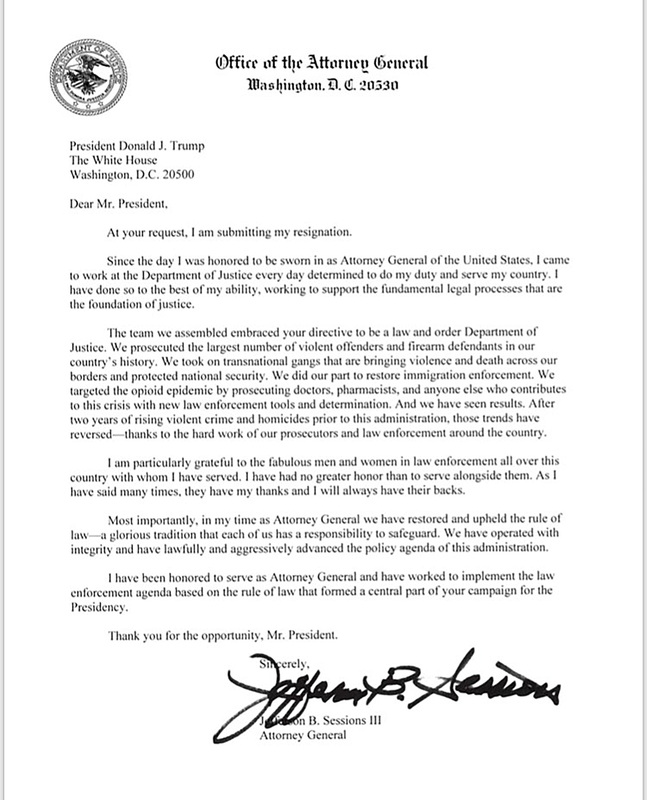 He wrote, “I have been honored to serve as the Attorney General and have worked to implement the law enforcement agenda based on the rule of law that formed a central part of your campaign for the Presidency. Besides, he thanked the President for the opportunity. It is often seen that the US President behaves rudely with his staff, especially when they oppose or question his decisions. Clearly, Trump cannot afford dissent from his own administration, and Kirstjen Nielsen’s discharge will be a clear indicator of this fact.